Welcome to this week’s email newsletter– and happy Super Bowl Sunday!I hope that everyone was able to find some time to get out and enjoy their weekend. The days just fly by sometimes, and I often forget how precious the weekend time can be. We do have quite a bit going on this week, so please read every section of this newsletter since there may very well be components that apply to you. Set Design/Construction. Students are doing really amazing work putting together a cohesive children’s show. We are also starting to discuss diversity within dramatic literature and are reading/watching a production of Lorraine Hansberry’s A Raisin in the Sun. Students will begin to build Hairspray set. Organization of Shift Sheets, Blocking Sheets, and Plots will be completed this week. Students will bring in music for options of music for Spring musical revue. Final decisions will be made in terms of group music choices, and all set lists will be completed. Solo work continues. Putting together a Revue and the structure of a revue becomes the major discuussion. ALL TECH STUDENTS ARE ALSO CALLED FOR SET BUILD TIME. DANCE REHEARSAL/MUSIC REHEARSAL 4:00-6:00 PM We will hope to have choreography rehearsal and Singing rehearsal during this time. SYMPHONY CONCERT STARTS AT 7:30 (CALL IS 7:00 PM) LEAD PARTS ARE ENCOURAGED TO WEAR COSTUMES THAT REPRESENT WHO THEY WILL PLAY IN THE SHOW. EVERYONE ELSE, JUST DRESS NICELY. THURSDAY 2/5– BLOCKING GOOD MORNING BALTIMORE, THEN REVIEW pgs 1-30 ALL CALL. BRING MOVEMENT APPROPRIATE CLOTHES. PRINCIPAL PARTS ARE ALL CALLED. THIS INCLUDES DYNAMITES, AMBER, CORNY COLLINS, PENNY, AND VELMA. I hope everyone had a very enjoyable extended weekend! A special thanks to the parents who dropped in to help with our first Saturday build which was very successful! Cast members should continue to check their email regularly to keep up with rehearsal scheduling and daily information. 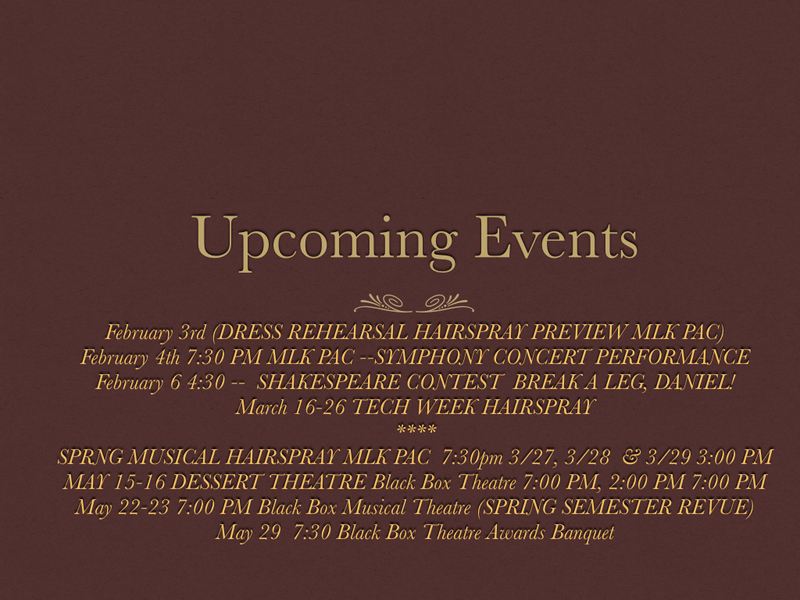 Attached to this email is also our annual program ad campaign for this year’s TheatreCHS Spring Musical Production. All ads will be in COLOR this year! You may also just give a SHOUT-OUT to a Cast/Crew member! SCRIPTS SHOULD ARRIVE ON WEDNESDAY! THURSDAY 1/22– ALL SPEAKING ROLES IN ACT 1 CALLED. IF IT SNOWS AND WE LOSE A DAY, WE WILL MAKE UP THE DAYS WE MISS FIRST BEFORE MOVING ON TO THE NEXT SCHEDULED REHEARSAL. Students will bring in music for options of music for Spring musical revue. Students will be prepared to perform song choices during block period this week. Possible guest visit on Friday to focus on vocal technique for musical theatre singing voice. This next week is the last full week of school before the end of the semester! I know.. I can’t believe it either. I am really excited about the rehearsal process for Hairspray as well as the fun projects that we are initiating for the semester ahead! As always, students should check CANVAS for any specific updates relating to classwork, and cast members should check their email regularly to keep up with rehearsal scheduling and daily information. This week, Charlottesville City Schools is providing a curriculum fair for all Charlottesville City School students. This event will be held at Carver Rec center (next to Staples). This will be happening on Tuesday of this week at 5:30 PM. Please drop by and visit the theatre/tech booth! I’d love to see you there! This year the Curriculum Fair will be held at the Jefferson Carver Rec Center from 5:30 to 7:30. This is an opportunity for families to learn more about course offerings and expectations of classes offered at CHS. 605 E. Main St., Charlottesville, VA 22902. THURSDAY 1/15– BLOCKING/ACTING REHEARSAL TRACY, PENNY, PRUDY, VELMA, ALL COUNCIL MEMBERS, EDNA, WILBER, SPRITZER—–> Mama I’m a Big Girl Now. FRIDAY—MUSIC REHEARSAL– REVIEW OF ALL MUSIC (ALL CALLED) 4:00-6:00 PM ******PLEASE ARRANGE TRANSPORTATION BECAUSE BUSSES WILL NOT BE ABLE TO PROVIDE RIDES AFTER 5:30 PM. They begin the process of playwriting in class– Applying theatrical elements to text. Students will finish reading William Shakespeare’s A Midsummer Night’s Dream. Modern adaptation and performance of adapted piece to be performed at a later date. TheatreCHS Newsletter 1/5-1/9 HAPPY NEW YEAR! I hope that everyone had a restful Winter Holiday! I am SO excited about the upcoming theatre events! To Daniel Neale for being selected to participate in this year’s English Speaking Union Shakespeare Contest in February. Dora Baker received first alternate. Recipients of this opportunity get to perform at Blackfriars in Staunton Virginia amongst other high school theatre students in the Charlottesville outlying community. Winners will have the chance to advance to New York City where they will perform at Lincoln Center. Students will transcribe a play given a familiar children’s book text. They will then create script and dialogue for a one-act play to be performed for Elementary School aged children. Students will begin to read William Shakespeare’s A Midsummer Night’s Dream with the mindset of becoming more accustomed to performing Shakespeare’s texts. Speaking roles only called from 3:45 until no later than 6 PM. Make sure that you check with with me if you are unsure of whether you are called. Tuesday: 1/6 :Tuesday is our first tech day specifically for hairspray. Wednesday 1/7 :Wednesday is an all call-music rehearsal with accompanist and assistant music director Katie Palmer. First Blocking rehearsal: Tracy/ Edna/ Wilber/Penny/ Corny Collins/Velma/Amber/Council Kids/ Link/Prudy understudies please attend. I hope that everyone was able to have a peaceful Thanksgiving Holiday! There are a lot of Theatre related activities ahead, and I did want to try to keep everyone posted as well as possible. Many thanks to those who were able to take time out of their busy pre-Thanksgiving week! We covered a lot of organizational information during our meeting. The meeting was largely focussed on the spring musical, and ways that the boosters can assist with productions as well as pre-productions. Online ways of raising money for program. Front of House, Door Assistance, concessions ideas. If you have any questions or ideas of ways that you would like to help out, please feel free to reach out to me. THIS WEEK WE HAVE SHAKESPEARE AUDITIONS!!! The English-Speaking Union National Shakespeare Competition provides teachers across the country with a performance-based program for the study of English Language Arts and Shakespeare. It is a school-based program serving Grades 9-12. Through the Competition, students develop communication skills and an appreciation of the power of language and literature. The Competition has engaged more than 250,000 young people since its inception in 1983. Students read, analyze, perform and recite Shakespearean monologues and sonnets in three qualifying stages: at the school, community and national levels. Approximately 2,000 teachers and 15,000 students in nearly 60 ESU Branch communities participate each year. The ESU National Shakespeare Competition has been recognized by the Globe Center (USA), the Children’s Theatre Foundation of America and the American Academy of Achievement. Many distinguished judges have served on the Competition panels. IT IS NOT TOO LATE FOR STUDENTS TO SIGN UP. The monologue must be no more than twenty lines (verse or prose). Our first TECH TUESDAY will be happening this Tuesday! ALL students are welcome to come by if they are interested in being on CREW or on the production team. Our first rehearsal Readthru/Singthru (ALL CALL) will be on December 12 from 4:00-6:30 PM in the black box theatre. NOTE: If you have a part, including all Council Members, you will need to be there. All singers are encouraged to also attend. Dancers do NOT need to attend, but of course are welcome. (If you are interested, we will have an Open Mic night after rehearsal). ALL HAIRSPRAY PARTICIPATION LETTERS NEED TO BE RETURNED AND SIGNED BY FRIDAY DEC 5 OF THIS WEEK. ** if you did not receive a contract, just come by and pick one up, or download the attachment, get it signed, and turn it in. Parents, please feel welcome to add any other skills or ways that you might be able to assist with the production, even if they aren’t listed on the page. After school rehearsals will be offered until the end of this week. MANY THANKS TO EVAN MOOK FOR HIS TREMENDOUS WORK! Emma K, you are doing a wonderful job with the Choreography!!!! “Once on this Island” Goes up on December 10 !!! TECH TUESDAY RESUMES THIS TUESDAY! MANY THANKS TO ALL FOR PUTTING IN FOCUSSED TIME LAST WEEK. Congratulations! Thank you for becoming part of what most definitely will be one of the most uplifting, fun, meaningful, energetic, and positive shows out there! IF YOU ARE CAST IN THIS SHOW, PLEASE COME BY THE BLACK BOX TO PICK UP A PRODUCTION AGREEMENT LETTER BEFORE TUESDAY AFTERNOON. YOU MAY ALSO CLICK ABOVE TO ACCESS THE FILE. THE SIGNED AGREEMENT LETTER NEEDS TO BE RETURNED NO LATER THAN FRIDAY DECEMBER 5th .